You are coming up with the mantra today! You are guiding this practice. This journey has been so rewarding. Thank you for your willingness to explore and your commitment to self study through YOGA. Thank you for sharing your time, your breath, your stories, your humor and your humanity with myself and this community. Day 30! This yoga practice is special. I’m taking off the mic and handing it over to you. Practice what we have been practicing for 29 Days – listening. Use me as a guide as I will be doing vocabulary that we have learned in Yoga Camp. Jam to the music of the video, or mute it and play your own tunes. Move mindfully, don’t push. Create a mantra for yourself today that resonates. Celebrate. Be present. Accept. Enjoy. Surrender. Love. Share your mantra and experience below. This practice is yours to Find What Feels Good. My mantra today was I am worthy. Worthy of a balanced life, worthy to receive and give true love. I looked at myself in the mirror after practice today and hugged myself and cried a little. I accept where I am in my journey and accept that even more greatness is to come. Thank you for your light, Adriene. Thank you, Chris, for sharing your gift behind the lens, and for always capturing those sweet genuine moments. You both have helped shape change in my life and for that I am truly, truly grateful and so appreciative. The love for what you do radiates in every video that you share. Adriene, although I barely looked at the video and you had no mic, I could hear your voice as if you were right beside me, helping me to meet my edge and then to go a little further, reminding me of my mantra. When you were in forearm plank-a pose i deeply struggle with-I joined in and was about to give up when i heard you say “you got this!”and i held it a bit longer before collapsing. A lot of the times when I did look at you, we were flowing through the same asanas although the timing was just slightly different. You’re an amazing teacher! I will continue to do your videos along with my own practice without a video because I am worthy of writing my own story. Again, thank you for helping me find courage to change my life, to look at myself with true acceptance and love. Jai namaste, my friend!! Thank you. Day 30 always emotional for everyone. I will be looking forward to a day off but by Tuesday I think about 6:00am I will be waiting for a video. Adriene, thank you for Yoga Camp and thank you for leading me to my yoga practice. I have also begun a meditation practice. You have many gifts and one of them is that you are an incredible teacher. All the mantras were intriguing, but the one that sparked my epiphany was, “I am grateful.” It’s so odd that something that began so randomly is now the connection and the bigness of everything–not to get too metaphysical, ew. My mantra today and going forward until the whenever is, “I am yes.” Thanks again, and to Chris-behind-the-camera. I really look forward. You know, to the whatever. Namaste, my friend. This was awesome. Because of you, I’m back practising now!!! Thank you Adriene for the humor, great instruction and all that food for thought. One question: where can I find the day 30 music list? As the second song started I got emotional and shed some happy tears. I thought, wow what a journey, I did 30 days of Yoga Camp – 30 days of showing up for myself on the yoga mat and working on a mantra. Today I AM PROUD. I can do stuff. Before Yoga Camp, I had not done yoga for a long time even if I love it and wanted to get started again. Yoga Camp was perfect for that. Thank you so much, Adriene! You made me realize that it is so important to find what feels good. From now I´m looking forward to joining more of your videos and picking a mantra for my day once in a while. Thank you. I’ve loved it. Thank you Adrienne for sharing the journey. During the journey I recreated my yoga space making it more inviting to hop onto the mat. Now I look forward to the time I spend on the mat. Despite a ski injury to my knee, I still did a very gentle yoga session each day honouring the limitations of my knee. Embarking on this journey has left me with a clear vision of what I want to achieve and it truly begins with loving oneself. Thank you so much for this camp Adriene! I have a new baby and did yoga camp each night after putting her to bed. To say that you/the camp have saved my sanity would be an understatement. Prior to camp, I kind of had the mindset that muscling through a 90 minute vinyasa practice was the only way to get a good workout through yoga. As you can imagine finding 90 minutes to do anything by yourself with an infant is near impossible. I was struggling to find time for myself. This camp really challenged me, forcing me to slow down and focus on one thing at a time, to carve out a few minutes of each day for me. I found myself coming back to the breath work on day 17 a lot and know I will continue to do so. On day 30, my mantra was I am here, present. Thank you so much and I look forward to more videos and a growing home practice. I loved the 30 days of yoga camp because of you Adriene and your approach to yoga. I found day 30 tough – I am at a point where I feel unable to make my own decisions or have the confidence to do so and was very comfortable being completely guided by Adriene. I committed to the practice, however, and really tried to overcome this feeling and “go with the flow” – throwing myself in. I never thought I would be a “yoga person” but somehow about 6 months on – I can’t imagine not having “yoga with adriene” in the mornings. When I travel to see mum, or go on holiday I download the videos and make sure I have them with me as a kind of security blanket but Adriene keeps talking about cultivating our own practices and today I understood what she meant. I am learning to trust myself and more amazingly say I love myself and actually mean it – something I really never thought would be possible. This gives me such hope that my two little girls will grow up to be happy and confident in themselves and just be grateful for who they are. Best YWA video EVER. Loved Yoga Camp!! Only at day 17, but enjoying myself. I got up with a terrible headache but it’s gone now! My cat, asleep on the couch, is practicing his ujjayi breath with me, haha. I enjoy (as I continue to use the videos) your videos and it has been such a nice change in my routine. I telecommute from home and yoga has been such a great change to my life and helps prevent my back pain from a weakened muscles due to an accident years ago! I look forward to yoga every day and feel so much more energized and strong now! Thank you so much for your positive and chill energy! Love! Thank you so much for these wonderful 30 days of yoga. I was wondering if you’d be willing to create some mini videos to use “on the go”, especially in the workplace on a lunch or break. I’ve been trying to incorporate this new, mindful practice into the rest of my day, and it’s incredible feeling the difference that it makes. Best wishes! The 30 days of yoga camp was perfect for me I have just started using affirmations in my daily life so the two fitted together perfectly. I was a few days late finishing due to a wrist injury requiring a few days rest, so my mantra today is I am whole, body mind and spirit. Thank you for putting this together for us all. My mantra was I am awesome. And I lived up to it. Today was so powerful. I felt strong and my balance was on point. I loved all 30 days but today was AWESOME!!!! The music was empowering and very soul satisfying. I needed this. I missed your quirkiness but nonetheless felt your guidance. Thank you for changing my life. Thank you for the wonderful gift of yoga camp. I’ve reconnected to my practice after a number of years away, and so many people have been commenting on how good I look, wondering if I’ve lost weight –I haven’t, I’m just carrying myself differently and am starting every day (I roll out of bed onto my mat) feeling confident, connected, and ready to go! After experimenting with some of your other videos, I found myself missing the message of camo, so I’ve decided to repeat it! LOVE IT! Thank you! I started following your videos are I love them!! Thank you so much!! I was just wondering if you could have a sequence for yoga before sleep for about 10/15 minutes becase usually I don’t have time to do your 30′ sequences during the working day and I would love to able to do it every day!! Thanks again!! My mantra for Day 30 is I Continue. Thankful for the past 1 month of guided home practice. Totally love Yoga Camp!! OK – wow! 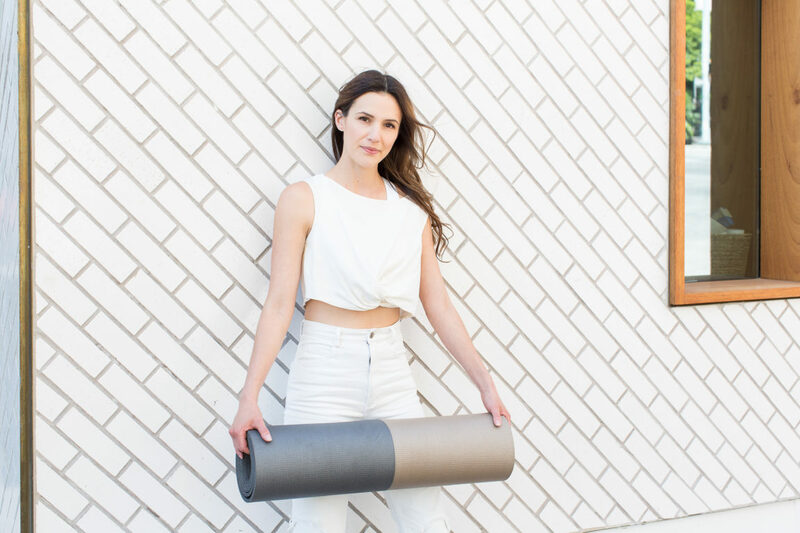 It took Jen’s comment to inspire me to try this and once I started I realized that my mantra was I AM CAPABLE – it was hard to let go of the guidance and write my own story and do what my body needed even if it wasn’t the “right practice”. This is what it is all about. I am so grateful – thank you! I want to say how much I appreciate what you do here, especially for beginners in the world of yoga. I’ve been trying to sign up for your weekly letter, but haven’t been successful. How can I contact someone to figure out what might be the problem? Thanks! Hi Shauna! I am sorry to hear about that! After searching mail to make sure it hasn’t been going to a weird folder… Email [email protected] and they will look you up and see what is going on! Today is my last day of yoga camp. I’ve had the flu, 2 times, hurt my neck while skiing, but day 30 is here. I’ll carry every mantra to my Vinyasa classes, and at home too. I’m sure you’ll continue raising my awareness and making me laugh in the most challenging asana. I had an amazing experience throughout 30 days of yoga camp. Thank you for learning me cultivate self-love and to love everything around me. It makes me feel so good. Thank you! You’re amazing! I feel like you are a true friend,although we’ve never met. I just had to write to tell you how incredibly grateful I am for you, and the many gifts you bring to the world. My daughter told me about you and your yoga website, and I am so thankful she did. Doing Yoga Camp has been a life-changing experience. I have been battling depression on and off for five years. For the past year and a half, I have been away from my job on sick leave. Taking the time for myself, to learn and laugh with your videos, has made so much of a difference in my mood and my attitude on a day-to-day basis. You have been enlightening, inspiring and reassuring, with a good measure of hilarious thrown in. You made it so easy to commit to self-care on a daily basis. I looked forward to the daily videos with growing anticipation as the days and weeks went by. I felt my confidence and courage grow as my practice and awareness deepened. The breathing brought quiet and freed me of my “monkey mind”, not just during class, but throughout the day. I feel rather bereft today, having completed Yoga Camp but, thanks to you, I plan to sign up for 30 Days of Yoga next. Your guidance and encouragement have impacted on all aspects of my daily life and…again, thanks to you, I am feeling well enough to return to work. My psychiatrist now believes one and all should practice yoga, and I would tend to agree! Thank you so much, Adriene, for bringing light and hope to me, up here in Thunder Bay, Ontario, Canada. I will be forever grateful. today was my day 30. thank you for this amazing feeling that I’m experiencing. I can’t imagine not to practice everyday now, not just for my body but for my mind. and you’re right, that’s what it’s all about. I love love loved the yogacamp!! Thanks a lot for your amazing gift. I have to admid that I sometimes got annoyed because of your small jokes or human talking in the beginning, but now I can only say: I just love it! I would love to buy the yoga camp t-shirt but can’t find it in the shop anymore. Is there any opportunity to buy it anyway? Thank you!!! Thank you so much Adriene for these wonderful 30 days of yoga! Had a hard time picking just one of so many inspiring mantras for today, so I kind of combined I enjoy and I accept. But then again, “I am grateful” also really has inspired me since “grateful day”, and I have to say it: I am so grateful for your videos, for your joy and energy and peace! I will definitely be coming back to my mat all year long, and that’s all thanks to you! You are fantastic Adriene! I loved the yoga camp! IT was really great! Made me feel awesome! Thanks a lot to you! What a fantastic journey! THANK YOU THANK YOU THANK YOU for leading this one. Namaste. I am an only child. My father passed away six months ago, and if one could say it was a beautiful death, this was it. My mother and I took care of him for a long time and held his hand to his final breath. He had a completely sharp mind, but his body was bound to his bed. He was so bummed out about not being able to move or do the things he use to do. I feel blessed we were able to share so many sweet memories and feelings before his final moment. Nevertheless, I have struggled with his absence, and I haven’t been able to really move on. A friend told me about Yoga by Adriene and said perhaps I should check out the website. So, Adriene entered my life. For thirty days, at 6:30 am, I have gone to camp and have honored my father’s memory by lighting a candle I received from someone that has his name on it. In doing so, I have found a way to honor ‘movement’ – something my dad missed so much and something I suppose I took for granted. I never realized when I showed up for him, I’d be showing up for myself. Emotionally and physically, I feel so much better. I have found a way to be with my dad each day, to feel inspired by every mantra and to value the thought that he is at peace and free. Thirty days of yoga – the gift of movement and freedom-one of the best gifts I have ever received. Thank you, Adriene. Life is good. Thank you so much, Adriene! After your introduction to today’s exercise I thought “But I don’t know how to do it without guidance!”, but the last 30 days found their way into my ahtletic memory and I was able to perform all the figures I wanted even in a flow-ish manner. I even found myself in one d. dog with my heels down! And for a few seconds I hovered on my arms only. So, Adriene, thank you so so much for providing Yoga Camp and for showing me how to go with the flow and for helping me find my athletic ambition again that I had lost. My mantra today was “I stay” … with yoga, with you and with happiness. A pile of LOVE to you! My mantra for today is I am happy, and I can honestly say that for the first time in a long time I am. I started this camp crying through most of the times during the first week and going through some stuff, but now I feel so much stronger, happier and better, more grateful and more present in my own life – shedding all that doesn’t serve me and focusing on purging those toxic thoughts. I couldn’t have done it without you! I have never been much of a sports person nor a spiritual person, but this time with you has helped me connect both to my body and mind, breath and energy to an extent I thought impossible for me and up to a point of really looking forward to my time on the mat as my favorite part of the day. It’s never too late to start practicing, to start enjoying your own company, to start taking care of yourself! You’ve taught me that. You have no idea how much this all means to me and how eternally grateful I am that I randomly stumbled across one of your videos and met the awesomeness that is you. Thank you and your team for all your effort, all your time and energy and thank you for everything you do. Thank you very much Adriene. My daughter who is 24 and taking a yoga course right now in India is the one that taught me about your videos. This is the second yoga challenge I’ve done with you and I’m so grateful for your teaching. You combine a sweet balance of speed, lightness, challenge, and love. Speaking of balance – today I was able to do a crow stand for a few seconds which I haven’t been able to do in years. You’ve helped my wrists and confidence grow stronger. I am so grateful to you Adrienne, for sharing yourself and your MANY gifts with us these past 30 days (and beyond)… I have never felt this happy and excited to do any exercise before (including previous yoga classes), but these days, I wake up and can’t wait to get to the ‘Yoga with Adrienne’ part of my day! It is truly a highlight, and I feel so wonderful physically, emotionally and mentally during and afterwards. The mantras have been amazingly accurate, and always seem to perfectly fit with what I need to focus on for that moment. You truly do have a gift for teaching yoga, and for helping inspire and motivate others in such a profound yet peaceful and accepting way. Your humility and humanity are so clearly evident, and wonderful to be ‘around’! Looking forward to exploring some of your other videos and routines, and to more chatty and lovely emails from you! OK…at 1st it felt like I was spying on you because you weren’t talking! Then it was hard for me to relax because I normally just close my eyes and follow your voice. Then I just realized how happy you were and I just let it go. I am so happy I found you. My body has been asking for yoga for along time but I was pushing it too hard in other directions. My goal is 2016 the year of yoga and see where my body and mind is at the end of the year. Thank you! You are a yoga goddess! Well, I just went through this series a second time. (I did 30 days of yoga in February and then Yoga Camp again in March.) This time my mantra was ‘I am home’. At home on my mat, at home on downward facing dog, at home in my skin. Thanks for a wonderful series! Three months later, but I’ve finished Yoga Camp; thank you Adriene. I could feel today how you really care. I’m sure I’m not the only one who has been transformed by you. Thanks for being so passionate about what you do and transmitting it to us. thank you for this wonderful journey. Today’s mantra for me was “I am ready”, and I really am. Life is waiting for me, and I am ready for it, all of it! My day 30 mantra was “I am my best”. The agreement to do your best was given to me by my lovely friend who read the book ‘The Four Agreements’ by Don Miguel Ruiz. Yoga has been in my life since 2012 and I’ve never looked back. Continuing to incorporate yoga into my life balance makes me feel that I am my best. I love myself. I value my uniqueness. I trust in my decisions and the opportunities the universe guides me to. I feel sane! I feel in control and focused on creating the life I want to live. As I get on my yoga mat, breathe, and feel the energy that allows me to do all the things that make me happy, then I am my best. I recently finished the 30-day yoga camp and I want to thank you for the incredible journey you took me to. Not only the practice did great things for my body, but also the everyday mantra moved me so much at my spiritual level that I can’t just thank you enough. The journey was, as you intended it to be, very emotional, indeed. I really appreciate, well, not appreciate, but LOVE the way you impart your class in such a way that it is modern, dinamic and spiritual in a very fresh and natural way. It really feels you’re speaking to me (I’m sure every one of your suscribers must feel the same way!). I thank you and trust you to be my guide in this! So, what’s next? #RevolutionYoga! I’m starting and loving it too! Hi Adriene, I’m just about to complete Yoga Camp. I’m wondering if you think the new series Revolution is more challenging and if I should start that from the beginning or continue on with some of the other videos that may be more challenging? Amazing. You are helping me greet my 60s with a renewed self of self and health. Thank you. Morning yoga with you has been such an amazing ritual, I call it a ritual because my day does not start unless I say namaste too you at theendof the class. The only time I relax is with you, I am learning how to breath slowly and how to empty my mind of everything. Thank you so much for all this, I want some more !!,! Thank you for this beautiful and profound journey <3 my mantra today is "It is possible" ! I really really loved the last day! I hope you do a full series like that some day! My mantra today is I love. I’m really trying to love myself more (not that easy for me), and to put aside negative thinking. Revolution, and 30 days of yoga have been really helpful. Thank you Adriene for bringing me on this path, thank you for your positivity and your encouragement. Yoga time is becoming more and more a cherished moment everyday. thank you for Yoga Camp – I have just completed my 30 days (over more than 30 days). I freaked out that you would be removing the mic as I listen, more than watch but I was pleasantly surprised that I could get through my yoga on my own.